It’s been a while since we got anything from McDonald’s, and we downloaded their app and got a deal where you order online and could get any sandwich for $1. 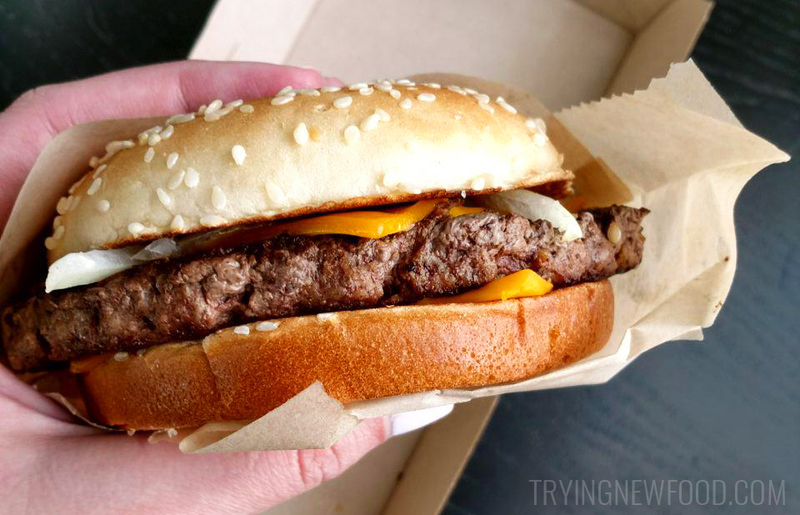 Perfect since we already wanted to try the Quarter Pounder with cheese. 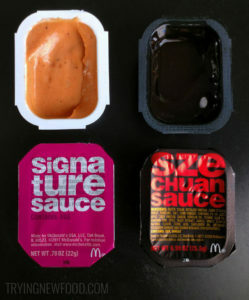 Their Signature Sauce is inspired by their Big Mac Special Sauce, but to me it tasted more like a sad Chick-fil-A dipping sauce. Personally, I would prefer honey mustard to this, but I’m a huge honey mustard fan. My husband said it tasted close to the Big Mac sauce. So we’ll agree to disagree. 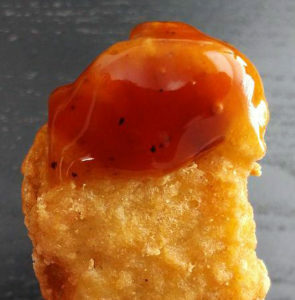 For McDonald’s Szechuan Sauce, it tasted strongly of soy sauce with a light amount of sweet chili sauce. It was okay, but I wasn’t blown away by the taste. Maybe my expectations were too high? It just made me wish I had got sweet and sour sauce instead. The nuggets were perfectly crispy on the outside with the classic chicken-y inside. Reminded me of being a kid and getting Happy Meals. I wish we could get little toys with our adult orders. Super happy I decided to get cheese on the Quarter Pounder. Even though this still had frozen beef, it was way better than I expected. I’ve never had one before. I was happy the onions were cooked a bit (raw onions give me headaches), and the mustard made it taste like classic McDonald’s. Must be the same flavor I remembered from their cheeseburgers. And for only $1 with my mobile app deal, this was the star of the whole meal for me. 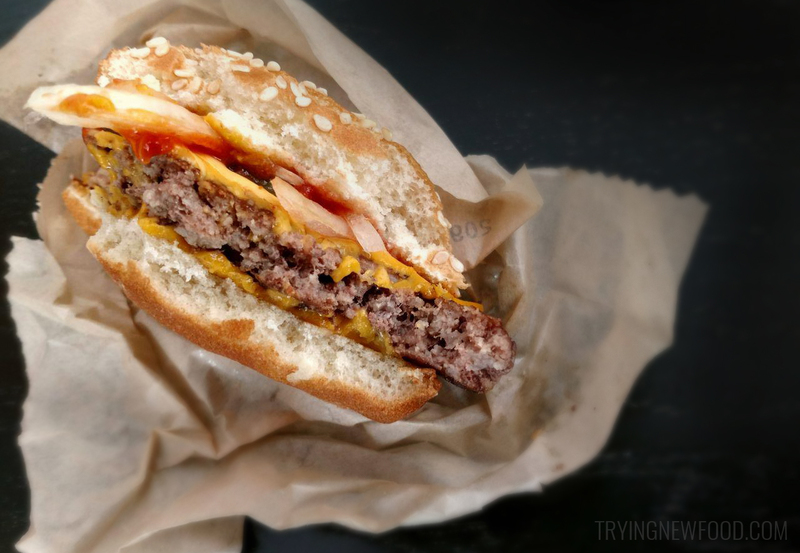 I took a photo of the inside of the patty, so we could compare it in the future when they switch to fresh beef. I saw on CNBC that McDonald’s “already brought fresh beef Quarter Pounder patties to about 3,500 domestic restaurants so far and it plans to reach some 14,000 U.S. locations by early May.” Maybe my location was using fresh beef, but we’ll see when I go back toward the end of this year and compare. 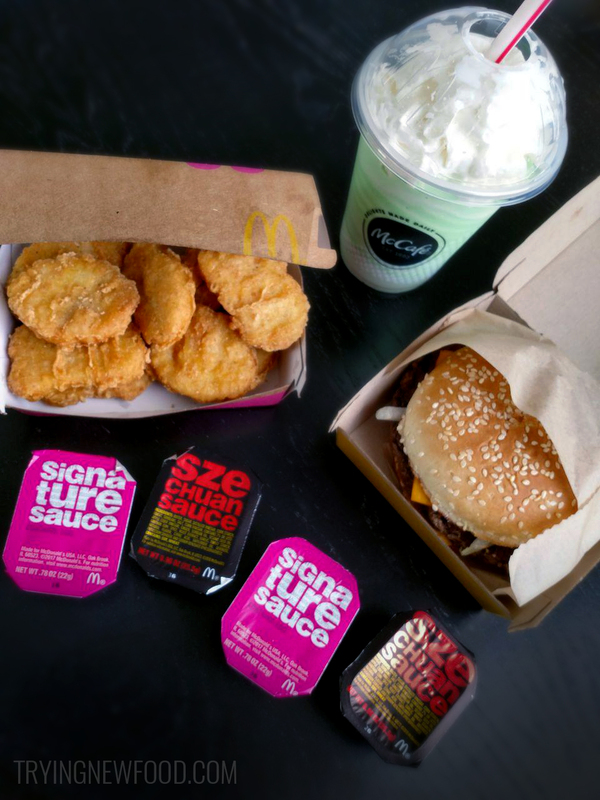 The Shamrock Shake was the same as last year’s, but with no cherry on top. It tasted like a vanilla soft-serve with a shot of mint syrup blended in. On top was whipped cream which was slightly sweet. Since it was super sugary, my husband and I only drank about half. All in all, we really enjoyed everything. 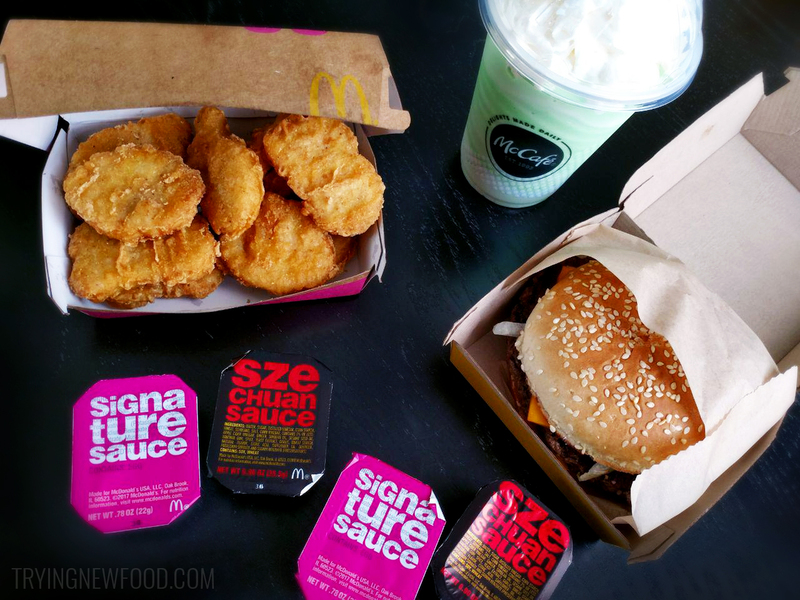 It’s a rare event when we go to McDonald’s since we are now trying to incorporate healthier foods into our meals. I wouldn’t eat this every day, but I would recommend trying that Quarter Pounder with cheese at least once, especially if you can get that mobile app deal.